Israeli President meets US National Security Advisor, asks him to ensure return of all Israelis held by Hamas in Gaza. 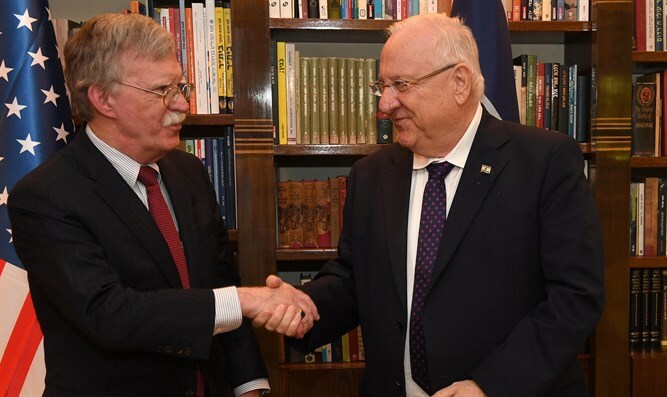 President Reuven Rivlin met Tuesday with US National Security Advisor John Bolton, who is visiting Israel. Rivlin called Bolton "a great friend of the State of Israel and the Israeli people. I want to thank you for everything you have done for Israel until now, and we are looking forward to what you will do for Israel." Bolton replied: "It's a great honor to meet with you and have a chance to go over all those issues. It’s a very challenging time for both Israel and the United States. I think just underlining the close friendship and alliance between the two governments and peoples of Israel and the United States is also important to do." During their meeting, the two discussed the issues on the agenda of the State of Israel in terms of regional security, mainly the situation in Gaza and relations between Israel and the Palestinian Authority. The President stressed that "Israel is taking many economic and civilian measures to improve the deteriorating situation in Gaza to prevent a crisis, but unfortunately Hamas is diverting resources to military buildup and terror activities." The President made it clear that security and stable quiet will be achieved by dealing with the civilian distress, and that any international effort to achieve this goal is important and necessary. Rivlin added that the international demand for humanitarian attention on the part of the State of Israel regarding events in Gaza cannot ignore Hamas's flagrant violation of the basic humanitarian need for releasing Israeli civilians and the bodies of Israeli soldiers Hadar Goldin and Oron Shaul who are held by Hamas, and urged Bolton to ensure this issue does not come off the agenda in any future dialogue. "The State of Israel is determined to act in any way necessary to neutralize these threats," the President clarified, and elaborated on the obligation to remove the Iranian forces from the region while mobilizing the international community. The President stressed the importance of the American withdrawal from the nuclear agreement and said it created "a unique window of opportunity for exerting economic pressure on Iran to effectively limit its nuclear capabilities and its expanding influence and subversion." On the Iranian issue, the President stressed Israel was closely monitoring increasing attempts to harm regional stability by Iran establishing itself in Syria and Iraq, continuing to develop precision rockets in Syria and Lebanon, transferring advanced weapons, and funding Hezbollah and Hamas. Bolton also visited the Yad Vashem Holocaust Museum and the new US embassy in Jerusalem.